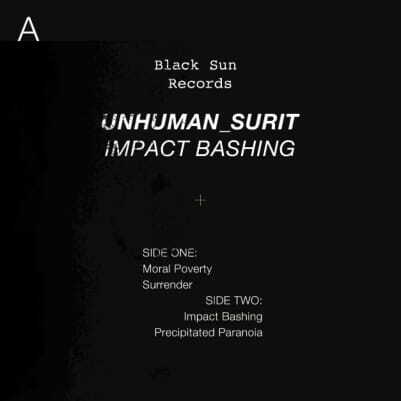 The Brvtalist is pleased to premiere a new track from Unhuman & Surit. “Surrender” comes off the EP, Impact Bashing, (Black Sun Records), a recent collaboration between two of the most exciting producers today. The Greek born, Berlin-based Unhuman has become known for his uncompromising mix of power electronics, EBM, techno and more while Surit has made major waves as 1/2 of Barcelona’s NX1 as well as solo work on the duo’s Nexe imprint and beyond. Impact Bashing is just as the same implies, 4 tracks of relentless rhythmic electronics and hard techno which slips between genres and creates a sonic assault. Today’s premiere of “Surrender” is the perfect example of the EP’s power. Impact Bashing is out now on 12” and digital via Black Sun Records. Pick up your copy at Ready Made. Also, don’t forget to catch Unhuman (DJ set) at our upcoming event with Instruments of Discipline on November 22nd in Berlin. RSVP + info here.